Forel, A. (1911) Die Ameisen des K. Zoologischen Museums in MŸnchen. Sitzungsberichte der Kšniglich Bayerischen Akademie der Wissenschaften Mathematisch-Physikalische Klasse 1911: 249-303. Total length of workers around 3 - 5 mm. Body color dark- to light-brown; legs dark brown to dark yellowish brown. Scapes, mesosoma and legs relatively rather short compared to other Japanese Aphaenogaster species. Posterior border of head flat in full face view. Occipital area opaque, covered with punctures. Dorsal surface of pronotum predominantly punctate medially, and with feeble, transverse marginal striae. Pronotal humeri angulate. Mesonotum distinctly raised, sometimes higher than pronotum, forming an angulate convexity covered with punctures and striae. Lateral areas of mesopleurae covered with punctures. Propodeal spines broad, their apices acute. The ant is found on the plains of eastern Japan (Mizutani & Imamura, 1980), and at higher elevations in the west, nesting in the soil or under stones in woodland or its margins. Chromosome number 2n = 22 (from Asamushi, Aomori Prefecture: Imai, 1969). Nishizono & Yamane (1990) reported a form with stronger sculpturation from a mountainous region in Kagoshima Prefecture at 400 to 500 m elevation. It has the dorsal surface of the pronotum almost completely transversely striate. Hokkaido, Honshu, Izu Is, Shikoku, Tsushima I., Kyushu, Yaku I.; Korean Peninsula, Jeju-do I.
Imai, H. T. (1969). Karyological studies of Japanese ants. II. Species differentiation in Aphaenogaster; with special regard to their morphology, distribution and chromosomes. . Mushi, 44, 137-151. Mizutani, A. & S. Imamura (1980). 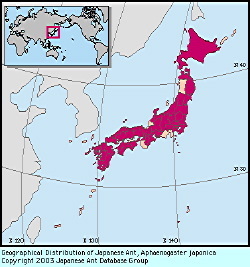 Population and nest structure in the ant Aphaenogaster japonica Forel, in Sapporo, Japan. . Kontyu , 48, 241-247. Nishizono, Y. & Sk. Yamane (1990). The genus Aphaenogaster (Hymenoptera, Formicidae) in Kagoshima-ken, southern Japan. . Rep. Fac. Sci. Kagoshima Univ. (Earth Sci. & Biol. ), 23, 40. Original text by Hirofumi Watanabe and Seiki Yamane. English translation by Kazuo Ogata, edited by Robert W. Taylor.